The Invention of the Modern World: Preface and acknowledgements. THE UNIQUE OPPORTUNITY and honour offered to me by being invited to give the first Wang Gouwei lectures at Tsinghua University in March 2011 has spurred me on to try to draw together many of the thoughts, both published and unpublished, which I have been gathering together over my lifetime of pursuing the riddle of the modern world. This is a book which synthesizes a lifetime of reflection on the origins of the modern world. Through forty years of travel in Europe, Australia, India, Nepal, Japan and China I have observed the similarities and differences of cultures. I have read as widely as possible in both contemporary and classical works in history, anthropology and philosophy. My previous attempts to understand the curious emergence of the modern world have been published in a series of books. It effectively started with The Origins of English Individualism, which has been published in Chinese, and is a continuation of that account. Later works dealing with this theme, particularly The Culture of Capitalism, The Savage Wars of Peace, The Riddle of the Modern World and The Making of the Modern World have as yet not been published in Chinese. Although I speak almost exclusively of England in the following book, it was written explicitly for a Chinese audience. I wanted to explain to my Chinese friends and the audience of my lectures and readers of this book some peculiarities of the history of British civilization which might be useful for them in trying to understand the West. My assessment of what would interest a Chinese audience is based on eight visits to China since 1996 with my wife Sarah, as well as teaching a number of Chinese postgraduate students. DURING MY VISITS over the last fifteen years I have seen the amazing transformation of China and its onward march towards equality with the west in technology and material affluence. I have also witnessed the ‘clash of civilizations’, not in an open and aggressive way, but at a deeper level of values and culture. In order to understand this confrontation better it seemed worthwhile exploring some of the inner dynamics of the earliest western industrializing nation. I have long been interested in the ways in which East and West can both mutually respect each other and learn from their mutual history. I had previously studied this problem in relation to Nepal and Japan. But now China presents the most dramatic case of the need for cross-comparative understanding, both because of its size, the great depth of its history, and also the extraordinary speed of its industrial and economic growth. The central problem for China in the future is how to retain its own distinctive culture and identity, so shaken by the events of the twentieth century, whilst also absorbing the best that Western civilization can offer. The other great problem China faces is similar to one which is facing the west in its movement into full modernity. This is the problem of social cohesion – what holds a civilization together. This was the central philosophical and sociological problem facing those in western societies who saw that in an urban-industrial and highly mobile society, the old bonds which held people together – namely the family, status hierarchies, fixed communities, religious belief and political absolutism – were no longer strong. They could no longer hold a nation or civilization together. The ‘imagined community’ of the nation was a partial answer. Some countries tried intense political centralization (fascism) or utopian communitarianism (communism). Yet the experiments did not work. What alternative is there to these philosophies of the right and the left? This book tries to give an answer. THE PROBLEMS WHICH faced thinkers like Marx, Weber and Durkheim in the late nineteenth and early twentieth centuries have become more pressing today. With greater education, faster communication, global economic markets and all the characteristics of what is now termed ‘globalism’, the problems are intensified. Given that China stands at a cross-roads, its material progress fairly assured but its political and social order still to be worked out, it seems to me that it might be of benefit for the Chinese to have an account of the origins and nature of the development of modernity in the West – both its advantages but also of its costs and unintended consequences. The case of England is particularly relevant here, for England, as I shall argue, brought ‘modernity’ into the world and is the oldest modern nation. Explaining its history and structure may give a Chinese audience a comparative picture of what the choices for their future are and what can be achieved. I SHOULD EMPHASIZE that the following account may surprise or even shock those readers who have learnt at school or university something about English and European history. They are likely to have absorbed the Marx-Weber theory which dates ‘modernity’ either to the ‘English revolution’ of the English Civil War in the middle of the seventeenth century, or the ‘Glorious Revolution’ of 1688. Or they may have been taught that the ‘watershed’ when a feudal, peasant, pre-modern society turned into a capitalist and modern society occurred in the sixteenth century with the religious Reformation and the start of serious long-distance trade and Empire. This book challenges this set of theories and argues strongly for the reinstatement of an older theory which was displaced by that of the great late-nineteenth century sociologists. It suggests that there is a great deal of continuity in England from the eleventh or twelfth century and that there is no break in the ‘long arch’ of modernity over the last thousand years. So some readers will have to suspend their disbelief and, hopefully, some will be persuaded by the coherence of the alternative story I tell and the evidence I present. When I gave the lectures I likened the pursuit of an understanding of modernity to the process of filling in a jigsaw puzzle. The extraordinary change from an agrarian to an industrial world, first achieved in England, was the result of a set of interconnected features, all of which were necessary, but none of which, taken singly, were sufficient causes of modernity. In the first case, the key to unlock modernity has to be exactly right. And it is not just a matter of getting each part right, but it must be placed in exactly the right relation to the other parts. Thus the relation of religion to politics, of the family to the economy, of games to civil society, as well as many others, needs to be exactly correct. The chances of this happening in the first case were thousands if not millions to one against. Yet it did happen and after it had been achieved it became much for others to copy the first exit from an agrarian civilization. 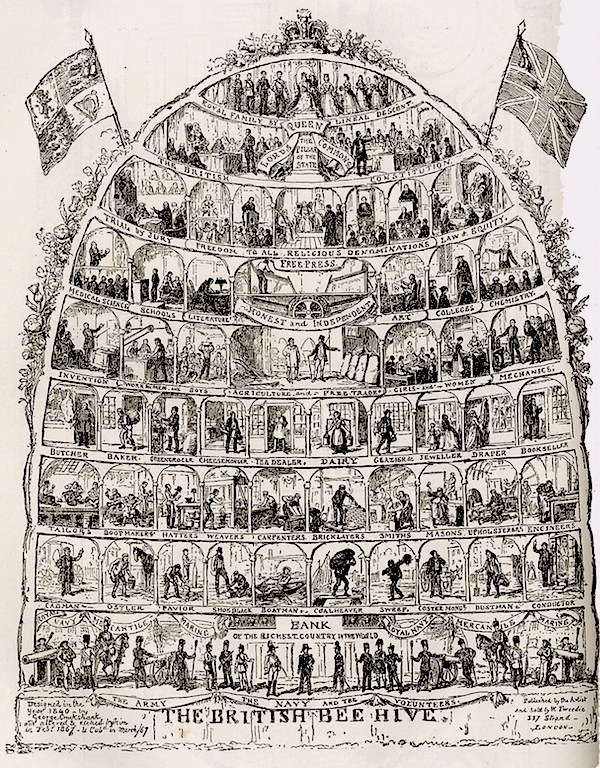 Cruikshank's 'British Beehive'. Click to enlarge. THE BASIC DIFFERENCE currently between England and China is that the former is fully modern. That is to say that in England the civilization is based ultimately on the individual, who alone links together the separated worlds of economy, society, religion and politics. Each individual is a microcosm of the complete society, with his or her intrinsic rights and responsibilities. China on the other hand has historically been a group-based civilization where the individual is less separated off from others, where relationships are intrinsic to a person’s identity, where each person is only made complete by being joined to others. In other words, the full separation of economy, polity, society and ideology (religion) has not yet fully occurred in China. The question this raises for the future is whether China will, can or should move further down the road of atomized, separated, individualistic civilization of the West, and how much it should retain of its relational civilization. So far it has largely individualised its market economy, but its society, polity and ideology is still quite embedded and non-individualistic. It may be that the confrontation between two basic models of man and society cannot be resolved and ultimately a civilization has to choose one or the other. Or it may be possible to find a compromise, a hybrid, a middle way. Whatever the outcome, a clear and simple description of the competing ideology and social structure of the West may be useful for the Chinese as they work out their future. A NUMBER OF those who attended the lectures pointed out that in practice, the separation of spheres was often ignored in the West, for example economic power and lobbying of the politicians in the United States. So it is worth stressing that this account is describing a simplified model, an attempt to keep the spheres of life separated, which in practice often fails. Very often ‘corruption’, as it is called, or the mixing of the spheres, occurs in practice. What is unusual, however, is that in these modern societies there is such an ideal – whereas normally in the past and still in many civilizations, it has been assumed that politics and religion, and society and economy are joined together. This is the difference – in the ideal more than in the actuality. It is worth noting that there is an ambiguity in the use of ‘English’. Until the two Crowns were merged in 1603, England and Scotland were separated. They were not formally joined until 1714 with the Act of Union. It is therefore legitimate to talk of ‘England’ (which for long includes Wales) until 1714. After that date it would perhaps be preferable to talk of Britain or the United Kingdom. Since much of what I am describing is in origin ‘English’, even when it spread to Scotland and Wales and Northern Ireland, I have tended to talk about England and the English. Finally, as I state in the first and last chapters, although I am proud of my country and feel that it has indeed made a special contribution to world civilization, I would not wish to be thought of as what is called a ‘little Englander’. England was made out of all the cultures of the world. It is a mongrel nation with such a mixture of peoples and influences that it can be said hardly to exist as a separate entity. Nor is its way morally superior to that of other civilizations. Nevertheless I find, as an anthropologist who looks back at this little island from the vantage point of the Himalayas, or Japan or China, that it is indeed a strange place which has peculiarities which have had a huge influence. My book is an attempt to analyze these features and thereby to understand better my country, the modern world and myself. THIS BOOK IS a considerably expanded version of the Wang Gouwei lectures given under the auspices of the Tsinghua Academy of Chinese Learning. I am deeply grateful for the honour of the invitation and to the Academy and also more generally Tsinghua University for giving me this opportunity to speak to their students. In particular I would like to thank Professors Liu Dong, Li Bozhong and Liu Beicheng for their part in making the visit possible and productive. The lectures are supported by the Kaifeng Foundation and it was a special pleasure to get to know the founder and chairman of the foundation, Duan Weichong. I thank the Foundation for their generous support to me and my wife, Sarah Harrison. Finally, I would like to thank Yu Wanhui and Li Danjie who made so much effort to make our visit such a pleasure. Numerous students also contributed by their presence at the lectures and in discussions outside the classroom. The book is a summation of a life’s work and therefore I have intellectual debts to countless people, my family, my teachers, my colleagues and my students. A full acknowledgement would be very lengthy so I hope that they will all accept my general thanks and gratitude for the numerous ideas which they have shared with me. A few people, however must be named. Among my family, my mother and father, Iris and Donald Macfarlane, gave me the love and support which helped to make me secure in my own English culture on my return from India where I had been born. Among my teachers, my school history teacher, Andrew Morgan, and my university teachers, Harry Pitt, James Campbell, Keith Thomas and Christoph von Furer-Haimendorf, gave me a grounding in history and anthropology, furthered by Jack Goody, Peter Laslett and others. Among my friends, I am particularly indebted to Cherry and Michael Bryant, Gerry and Hilda Martin, Mark Turin and James C. Bennett. My publisher-turned-agent, John Davey, has always been encouraging. Xiaolong Guan has translated a number of my books into Chinese and added to this by translating this work. I am especially grateful to her. Above all, however, I am indebted to my wife and intellectual companion, Sarah Harrison. She has done much of the hard work upon which this book is based, both in historical reconstruction and anthropological fieldwork. We have shared this intellectual journey now together for forty years. She has read and improved this book, as she has done almost all my others. Without her I could not have written this work and it is very much a shared creation. The Spring-Summer Serial 2012 | Introduction and index of chapters. Publication: Thursday, 29 March 2012, at 10:39. Options: Archive for Alan Macfarlane, Invention of the Modern World. Bookmark the permalink. Follow comments here with the RSS feed. Post a comment or leave a trackback.